Inspired by the commitment of the Puketapapa Local Board to Te Auanga Oakley Creek, we joined with the Weona walkway community group and approached Albert Eden Local Board regarding protection and enhancement of Meola and Motions Creeks. We proposed that the AELB annual plan include a vision for both creeks, for Council and Community groups to work towards. We have asked Puketapapa and Waitemata Boards also to contribute as key landmarks such as Te Tokaroa Meola Reef, Western Springs and Three Kings all play a major role in the Meola-Motions natural landscape. by public works including national roads and other infrastructure; stormwater and wastewater from whole suburbs disappears, surfacing several kilometres away in local parks like Kerr Taylor reserve. 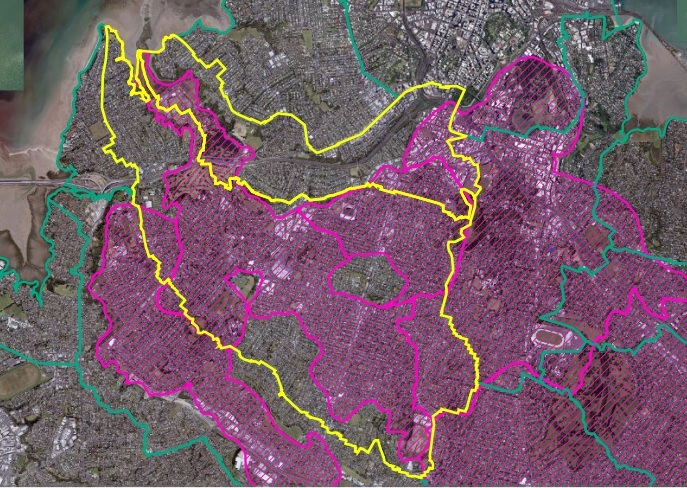 The map shows Motions and Meola catchments in yellow, and the underlying aquifer in pink. We are entering a time of great change with a $1 billion central Interceptor and Chamberlain Park projects causing landscape changes. 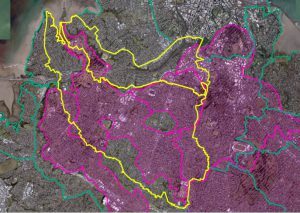 We feel the community needs a ‘big picture’, partly to provide a background for the community work between Watercare and Meola Forum on Meola catchment changes from Central Interceptor. We also felt it could boost recognition of the need for a (formal and informal) mountain to sea path way to connect communities for cyclists and walkers. We look forward to progressing this plan and vision for the community.